So here we go again, with yet another movie to promote the famous franchise of Pokemon and entertain us by throwing random villains, powerful Pokemon and some explosions. Being those the primary objectives, Phantom Ruler Zoroark actually does a decent job. As a matter of fact, no matter how hard you try, it's impossible to see a single attempt of making a movie which sustains itself; all for the sake of advertisement. So why bother writing a review? Exactly because of this uncompromised environment, allowing the viewer to simply erase everything in his mind and enjoy an equally uncompromised experience. Quality-wise, the movie holds the tradition and invests on eye candy visuals to grasp attention — since this job isn't very suitable to the plot or characters, but we'll talk about these latter. Fluid animation and CGI effects are elements essential in order to build some exciting action scenes, which absolutely cannot be removed of a Pokemon movie. The character design... well, it's the same as always: generic and childish, but it's part of the franchise's style, so you can't avoid it. The sound? Oh, yes, there is sound. It's not like Pokemon's voice actors lack emotion, though that's precisely the case of the soundtrack, but probably the lame ones are the characters themselves. Not even Wakamoto Norio could do something to help if he wanted. Speaking of characters, that's a somewhat difficult to analyse item in the franchise's movies: you can't discuss about the protagonists because their development happens in the original series, since the movie is merely another adventure, but you can't simply discard them. Nevertheless, what doesn't change is the fact that characters serve, amongst other purposes, as means to get the viewer's empathy or hate. Phantom Ruler Zoroark fails at both, whether at the good or the bad side. Let's start with the villain perspective for a change: a one-sided dude who wants power at all cost despite any consequences. Oh, we've never seen this type before, right? The interesting part is that he really doesn't give the vibes of a big bad guy many times. I mean, he is bad all right, but who is he against? The three legendary dogs, Celebi, Zoroark and Zorua. The previous two don't seem much of a threat, but have you ever tried to mess with a son in front of the mother? Don't even try, as that's definitely not a good idea. And his ability doesn't help too much because he can see an immutable future, meaning no one can change it. As for heroes, you have Ash, his usual gang and a couple of random guys. This time there isn't even a back story or something, they are simply pawns used to face the villain. Actually, facing the villain isn't really their jobs; instead, all they do during the whole movie is: distract enemies, help setting traps and other minor chores. The rest us up to Zoroark, Raikou, Entei, Suicune and Celebi. Look, Director-san, Writer-san, no one is saying that Ash needs to be a legendary hero destined to save the world in every single movie (I don't even like him), but c'mon, he is the freaking main character! Surprisingly, the narrative is pretty good for a Pokemon movie. Of course, this whole time travels/future stuff has been explored many times, twice just in Pokemon movies, but the plot flows well enough. Little by little the pieces come along: first there is a problem, then our heroes try to solve it, while at the same time we have a cunning villain making his moves and the legendary dogs trio observing the situation. Eventually the good guys figure out the villain's plan and use his own scheme to defeat him. A pretty straight forward approach, but it works. Anyway, the main question remains: "Should I watch this? ", to which I can answer with another interrogation: "Well, why not?". Phantom Ruler Zoroark is overall a nice family movie, although teenagers who are not fans may want to skip this, offering mindless fun with cute, likable and innocent monsters fighting against an evil ambitious man. Just think how many moral lessons the parents will be able to elaborate! ... Not really an exciting thought, but there is some good amount of action scenes for those with a fare for adrenaline. As for the fans who withstood every single movie until now, one more shouldn't hurt. Zoroark: Master of Illusions is a big comercial for the next generation of Pocket Monsters and a big celebratory party for Zoroark, Pokemon's new mascot. Unlike Lucario's film before it, which was an ambitious attempt at a grand adventure, Zoroark's work is mostly content with keeping itself inside one town. Everything lies in execution, though, so lets analyze the film. 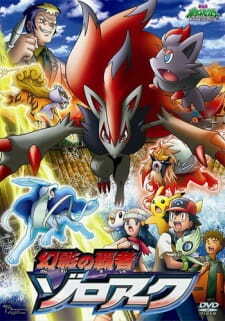 The most notable thing that sold the film to the audience is the titular star, Zoroark. Being a furry bipedal creature with an elongated face and no legendary status, Zoroark has a few more than passing similarities with Lucario, the star of the 8th Pokemon film. Personality wise, the two are nothing like each other. As for their role in their respective pictures, the two share no similarities. Thus, we can lay to rest any accusations of plagiarism. The main plot, by itself, is pretty weak. It hinges on the personalities of Zoroark and the main villain to keep us occupied. Zoroark performs his job with good marks. He's nice to watch, menacing and his powers give us enough eye candy to enjoy most of his shenanigans. Kodai, on the other hand is a mixed bag. After witnessing terrible villains such as Marauder and Zero in previous Pokemon films, it's hard hate Kodai much. He often falls flat and his incredible wealth is a bit hard to believe, but at least it's some kind of an explanation for his high tech gadgets. While subpar, he can hold his own as an unlikable, yet not annoying guy up to the very end. Ash and company feel like simple audience stand-ins. Their job is to watch, comment and keep up with Zoroark. They're given some interesting dialogue and a few funny quips as Zorua, Zoroark's child, plays with them. This keeps them from getting annoying and keeps the dialogue fresh. Through the film we're introduced to a few additional supporting characters and they're used efficiently, albeit conservatively. Soundtrack is uninspired and while the art design is nice to look at, it lacks an outstanding location or two. The location of the final showdown is underwhelming, as well. These two form the biggest crime this movie committed - it felt uninspired. When a movie you're making focuses on a singular Pokemon star, it's understandable to put the plot and other characters in the backseat, but the presentation should still matter. Over all, I was underwhelmed. I'm a huge Pokemon fan but I was never really into the anime. It was always so childish, and I thought they could do so much more. However, the producers totally step it up in every way when making the movies. The story is about Zoroark and how it is both a good guy and a bad guy. The sound and artwork is pretty good, but the story is too bland in my opinion and they are always making lame plot twists that could have been more interesting. The Pokemon battles left me bored, and the new characters were boring as well. I did not enjoy this very much, and I thought it was a horrible way to promote the 5th generation of Pokemon. More importantly, it didn't leave me with that feeling of nostalgia that the early Pokemon movies did. I'm not saying that you shouldn't watch this, but I'm warning you not to have high expectations as this movie is incomparable to Pokemon 2000 or Pokemon Heroes. Ash and friends reappear in yet another Pokemon movie, but still retain their usual bad qualities. Story: Absolutely dreadful. They featured Pokemon that were going to be the main focus of the film, yet only one of them was of any importance. The story was very underdevloped and was never fully explained very well. Art: The effects for attacks were pretty good in terms of showing off. The Pokemon designs aren't too bad either, but still nothing too fancy. Character: Pretty much no character development is made much. They throw in all the new characters that shown up in the movie and they just do much except watch Ash and friends deal with everything. As for the feature Pokemon, there was pretty much no reason for them to even be included in the film and can just be easily replaced by anything. Enjoyment: Nothing noteworthy. Just simple attacks in pretty much every scene and no actual battling. And every other scene just involves story development that is just simply boring to even watch. There should be no reason to ever watch this movie, unless you're a die-hard Pokemon fan. Bad story, no good character development and action scenes without much of the action.